"even though Wikipedia prefers the spelling Bruegel" - If Wikipedia is to be trusted, this is the way he spelled his own name later in his live, his sons changing it back to the original Brueghel. Nowhere does Wikipedia mention the option of writing it with "eu" instead of "ue" (that's not to say such a misspelling wouldn't be common, as "eu" is the "modern" way to write /øː/, but historically it seems only "ue" is correct). Oh, Dutch... Just looking at the Wikipedia article on Dutch phonology makes me cringe. Such a disparity between the symbols and the sounds! Which would be OK if things were unfixable, such as in Danish, but here matters can easily be corrected. Funnily, in LPD the velar sound is x in the Dutch transcription. Too bad I can't find neither Groot uitspraakwoordenboek van de Nederlandse taal nor Uitspraakwoordenboek anywhere in some online bookshop. Are there any other Dutch pronunciation dictionaries? as well, so presumably that is correct. Which makes the [ɔɪ] in English even more mysterious. As far as German, I remember being startled at finding out that ‹eu› is ɔʏ, I never thought the second part of the diphthong was rounded. But now even seems to be obsolete, or perhaps too Siebsean. Funnily, I find the Dutch spelling-to-pronunciation rules very easy and let's say Netherlandicly no-nonsense, practical and parsimonious. In Poland we often spell the name 'Breug(h)el' and always pronounce it the German way, with /oi/. This used to infuriate me in my younger years but now no longer. Oh, I wasn't referring to grapheme-to-phoneme rules. I was referring to the vowel chart. Just look at it. OK, but what particularly do you find so abominable? Uitspraakwoordenboeks for Dutch are hardly necessary, since the grapheme-to-phoneme rules are so easy and consistent. About England I don't know, but in Poland there was (is no longer) a tendency to imagine that 1. Dutch is very like German, (not true), hence 2. spelling-to-sound rules are like those in German (still less true). And even if 1. had been true, the passage from 1. to 2. is fallacious. Re 'Breug(h)el', I think what explains this mis-spelling is the fact that in German, '...ue..', tho' possible, is very rare (normally they spell 'u with two dots) and '...eu...' is frequent to very frequent. This does not explain why there should be Dutch/Flemish mis-spellings like that, it works but for the _buitenland_. Misspelling? Or just reformed spelling? One of the possible birthplaces of the elder Brueg(h)el, according to at least one Wikipedia contributor, is Breugel near Eindhoven. Yes, that would explain why the Dutch pronunciation is irregular and corresponds to 'Breugel' and not to 'Bruegel'. Yet in the buitenland I'd suspect the former IS a misspelling, due to the above-described suggestion from German. 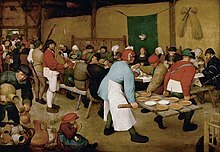 My alternative theory is that Breughel was a French (Walloon?) spelling, which makes sense phonologically, and that this spelling spread from French to English. Since we decided it is ‹ue›, is it ‹gh› or ‹g›? For aught I know, they used to write 'gh' in Dutch in the past, maybe to signal the fricative pronunciation---jeught, youth, daghen, days--but do so no longer, so 'Brue/eughel' may be archaic/historical/sanctified by the centuries of the history of the families so called. Note where ɪ and ʏ are – perhaps ɘ and ɵ are a better fit. Look where y is more like ʉ. What to say about the diphthongs except that that is one big mess? œy? For real? It seems more reasonable to use ɐʏ. ɛi not such a flagrant example, but perhaps æɪ could have been chosen just as well. But... Gussenhoven is not a conjurer of cheap tricks and there must be a reason why someone with a PhD in Dutch phonology, which I presume he has, chose what he chose. Ah, yes. But this phonology, not phonetics. They hold fast onto the symbols they once picked out for their phonemes, phonetic changes in the meantime not in the least withstanding. I agree that ɐʏ would've been better (than œy) for 'ui', but once you know it... the same, mutatis mutandis, holds for the symbolism of the English phonology, does it not? There is certain virtue to such a conservatism, even, is there not?... Besides, the Dutch 'long' /a/ seems to my ear even fronter than on the diagram, as if the Dutch wanted to catch up with the GVS with a 500 year lag. I've had a look at the article on the Dutch Wikipedia. It's interesting that their vowels modify before /r/ and /l/, which is common in varieties of English as well. Though that dipthong might actually be ɞɪ because both elements seem to be rounded. Ed, check Danish, you'll have fun with vowels before the ʁ phoneme. As for the symbols chosen, remember that there's a great variety in Dutch pronunciation, especially in the vowel department, so perhaps Gussenhoven chose some middleground between Flemmish and Netherlands Dutch. @Ed: Though synchronically it seems that /r/ modifies vowels, diachronically the vowel values before /r/ are in most cases the original ones. Were most "long" vowels have diphthongized to closing diphthongs, they didn't before /r/. My guess is that since /r/ needs some room (especially the rolling variety), closing the vowel is difficult. So we get the original /y:/ instead of /œy/, /o:/ instead of /oʊ/, /ɪ:/ (from original /e:/) instead of /eɪ/, /ʏː/ (from original /ø:/) instead of /øʏ/. Well -- or rather: eh bien --- what supports that theory? The usual spelling in Spanish publications is "Brueghel". The name is pronounced ˈbɾweɣel in Castilian Spanish and ˈbɾwɛɣɛl (or even ˈbɾwɛɣɛ) in my own southern dialect. Seriously, this ...ue..., so frequent in Castilian, makes 'Bruegel', rather than 'Breugel', so attractive to you others, right? Connoisseurs say ˈbɾeɣel -they don't dare to round their lips for the first vowel. And we prefer "ue" instead of "eu" simply because of the spelling. Your name, for instance, would be pronounced boxˈθjeʧ in CSp (when speaking in a very relaxed atmosphere, I would reduce it to bɒhˈsjɛ). If you want me to stress the first syllable, you'll have to write a (´) over the "o", because your name doesn't end with an "n", an "s" or a vowel! Very interesting video! Few people here pay attention to the different realizations of Spanish /s/. Gracias Emilio. El mi nombre... 'scuse me, my name, if written thus: voychej would be pronounce almost 100 p.c. correct if read out according to the normal letter-to-sound Spanish rules. Apical s is one of the most wonderful features of European Spanish and is also very relevant for those who want to speak correct Greak. I would love to hear somewhere one of those other Spanish s's, the apical dental grooved fricative. I'm afraid that, for most English speakers, Dutch is mentally categorized as "German, with a few variations that I can't be bothered with". Hence, for example, Anglophone football commentators will refer to Wesley Sneijder as though he were a German named "Schneider", even though /ˈsneɪdə(r)/is a far closer English approximation to the Dutch . You don't tell me, vp. Is that true? I mean, even the English...? And why should it be so? Too little exposure to either? Why? Well, how many English people learn Dutch? I know English people who have lived in the Netherlands/Flanders who knew barely a word of Dutch, because everyone spoke to them in English. do more English people learn German? And do they have so little exposure to Dutch as to be misled by those superficial similarities between G. and D.? In Poland, there hs been a change: people used to think that Dutch (little exposure) was very much like German (a helluva lot of exposure throughout our history) but now they do not, after however little exposure to Dutch they may have had in the meantime. For instance, they now longer say 'bosh' for Jeroen Bosch, the painter, at least no longer uniformly. And radio announcers (newsreaders) did not say 'Jaap de Hoop Sheffer (Scheffer)' but '...S-cheffer. And we're much farther away from the NL than are the English. I can say with a great deal of confidence that far more English people learn German than learn Dutch. I suspect that the "other modern languages" are likely to include Italian, Portuguese, and the major Indian, Chinese and Japanese lanauges. I've never heard of a school in England offering Dutch classes. That is true, vp. Dutch is related to Low German historically. If you know German, you can work out what a lot of Dutch sentences mean, but not all of them. However, from my experience, many Dutch people resent comparisons of their language with German. But there zillions of false friends between G. and D., so if you work out what a D. text means on the basis of your G. alone, and not of a 'goed woordenboek', you'll almost certainly get it wrong. One example: to invite, German 'einladen', Duch 'uitnodigen', which sounds a bit like 'force, compel' to a German ear. As far as German, I remember being startled at finding out that ‹eu› is ɔʏ, I never thought the second part of the diphthong was rounded. As far as I (a native speaker) can tell, it's /ɔɪ̯/ in the sense that the subsyllabic part varies according to the local pronunciation of /ɪ/. In northern Germany generally, [ʉ] is a common allophone!